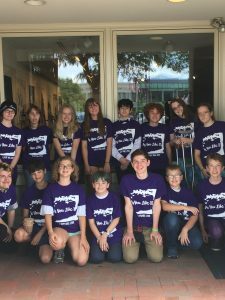 People's Shakespeare Project – A non-profit organization committed to help foster a love of Shakespeare through performance and performance-based instruction. 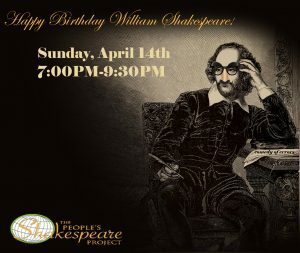 It’s time to once again celebrate The Bard with our “Happy Birthday, William Shakespeare” friend- and fund-raiser. April 14, 2019, 7:00-9:30PM. Purchase online here OR send a check to: TPSP, P.O. Box 8873, Lancaster, PA 17604. Tickets may also be purchased at the door. 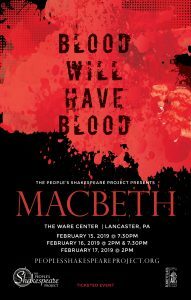 The Comedy of Errors is sure to be a madcap, hilarious happening at our new site at LancasterHistory.org. Be ready to to enjoy this fun play on the beautiful Wheatland campus. June 12-16 and 19-23, 2019. Auditions will be held late February. Stay tuned. We are thrilled to announce our move this coming summer 2019 to Wheatland (James Buchanan’s home), corner of President Ave. and Marietta Ave. You can find us situated behind lancasterhistory.org’s beautiful building. It is a secluded, lush green setting with shaded and level audience seating, plenty of free parking, room to picnic and sheltered from traffic noise. We thank Tom Ryan and lancasterhistory.org for welcoming us to their beautiful campus.